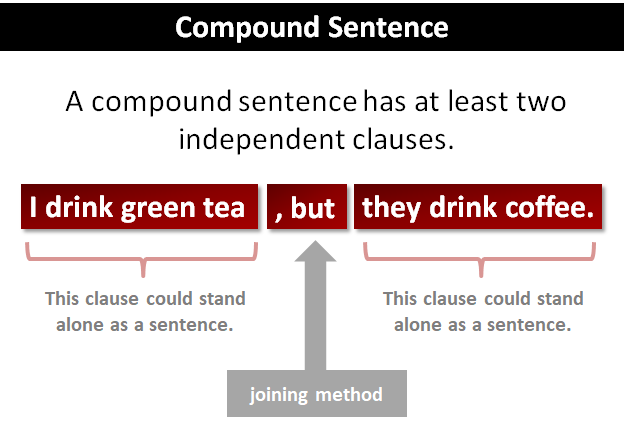 Compound Sentence | What is a Compound Sentence? An independent clause (unlike a dependent clause) can stand alone as a�sentence. Below are examples of compound sentences. In each example, the independent clauses are shaded. Here is a short video explaining what we mean by compound sentence. I like tea, and he likes coffee. Read more about when to use commas before conjunctions. I like hot chocolate; it sends me to sleep. Read more about using semicolons. I know one thing: I love that girl. Read more about using colons. I know you're here — I can smell your perfume. Read more about using dashes instead of semicolons and colons. After the lights went out, I could hear you whispering; and I know you were talking about me. Read more about when to use a comma before conjunctions. A compound sentence is one of four main sentence structures, all of which are shown below. In these examples, the independent clauses are shaded. I stopped believing in Santa Claus when he asked for my autograph in a department store, but I still want to believe in him. He is smart, and articulate. He is smart, and he is articulate. Read more about commas before conjunctions.